** Originally published in the Spring 1997 issue of The Crabbet Influence magazine. In 1981, two desert-bred stallions which Wilfrid and Lady Anne Blunt had imported to Crabbet were sold on to South Africa: Azrek, who was bought by Cecil Rhodes, went to the Cape, and Merzuk went to Basutoland. Other horses from Crabbet followed but were used primarily for upgrading local stock, and sadly the blood of all these was lost to purebred breeding. In 1905 the government established the South African Stud Book and the first Arabian entries were made in 1908. These early horses were largely from Crabbet stock but practically all trace of them has vanished. Then in 1927, Mr. C.W. Hough of England exported Shelook (Shahzada x Queen Shakra) to Natal. Although he was used mainly to breed Polo ponies, it is claimed that he was responsible for triggering interest in Arabians. In fact, the commencement of serious purebred breeding can be dated from 1938, the year in which a great horse breeder, Mr. C.E. Orpen, imported the stallion Jiddan from England. Bred by the Hon. George Savile by Sheri-I-Khurshid, a stallion Crabbet breeding, and out of Baida, who traced to the Blunt’s journey mare Hagar, Jiddan had been Reserve Champion in London as a 4-year-old in 1934. By his style and ability as a riding horse he attracted much attention in the Eastern Cape, and together with his success as a sire of partbreds, he promoted the Arabian breed once again. Jiddan’s only purebred on record was Orange Valley Night Star, but this revival of interest led to a number of subsequent importations, most of which were from Crabbet and Hanstead. One of the first buyers was Mr. G.C. Kock who, in 1946, bought from Lady Wentworth three stallions: Indian Gem, Indian Red and Shahim, and the mares Ghazala (Faris x Rasana), Nazziria (Naziri x Nexma) and her daughter, Nazrina by Star Royal. Mr. Kock’s stud was dispersed in 1951 but these three mares were purchased by Mr. P.J. van der Merwe who also brought in from the USA horses of predominately Crabbet bloodlines, including Rabiyas, sire of Abu Farwa. In turn, Arabians from Mr. van der Merwe’s Vlinkfontein Stud were bought by many new breeders. By this time there was a rapidly increasing interest in purebred breeding, and between 1945 and 1958 around 60 Arabians were imported from Britain, and a few from the USA, to form the true South African foundation stock. 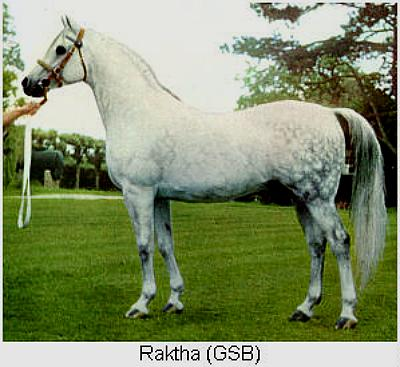 Possibly the most important horse of Pure Crabbet bloodlines to go to South Africa was Raktha by Naseem out of Razina. Lady Wentworth had acquired him from his breeder, Lady Yule, as a young horse and he became an important sire at Crabbet. Mr. A.J. Botha purchased him in 1951 at the age of 16, together with the mare Silviana (Oran x Silver Fire). In addition, the two sons of Raktha and three grandsons also imported from England, one in utero, have all added to the influence Raktha has on breeding in South Africa. Mr. and Mrs. J.B. Grobbelaar had the Raktha grandson Grantchester, by General Grant out of Rafeena, at their well known Jamani Stud and he proved an extremely good sire with their foundation mares Correze (Count Dorsaz x Namilla), Zena (Blue Domino x Queen Zenobia) and Garance (Grey Owl x Rikitea), all of which were bred at Hanstead. Grantchester was Supreme Champion in 1963 and he won numerous times at major shows in-hand and under saddle. Jamani was one of the most successful studs in the country for many years. Now in the ownership of Charmaine Grobbelaar, since the death of her husband some years ago, the Stud has recently been revived at the home of her cousin Leonard Buys by putting their Jamani mares to the young stallion imported from Britain, Silvern Gleam (Bright Crown x Silver Dream) of Crabbet and Hanstead bloodlines. It can be seen that a large proportion of imports were bred at Hanstead, or had Hanstead horses in their pedigrees, and it is probable that South Africa has been the country most influenced by Arabians bred by Lady Yule and her daughter Gladys. 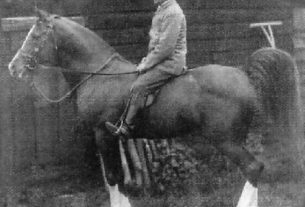 The majority of the Hanstead horses were, of course, of Crabbet bloodlines, but in some cases a different ‘Old English’ line comes in from the years when Lady Yule used other than pure Crabbet stallions, and from one mare (Rafeena) brought in by Gladys Yule in the later years of the stud. As a result all the horses referred to today in South Africa as ‘English’ carry a very high percentage of Crabbet blood. Other studs founded with Hanstead horses include Timarie, owned by Mrs. T.E.M. Murray, which was started in 1952 and produced first-rate stock for over 20 years; her foundation mares were Kumara (Grey Owl x Hama) and Kasala (Sala x Queen Zenobia). Mrs. M.P. Trollip bred the stallion Chez Nous Shah Rukh by Al Burak out of the Crabbet-bred Raktha granddaughter Silsilla, who was bought by Mr. V.V. Voorendyk and had a great influence on his Vidiko Stud. Mr. and Mrs. J.D.D. Kettlewell imported Fayalina (Fayal x Naama) and her daughter Irexia by Irex, who produced Jerico Sherifa by the Hanstead-bred Chief Kasalo (General Grant x Rikitea); Sherifa became a highly successful foundation mare for their Jericho Stud. They later introduced a new line to Raktha when they imported Barabez, by Stargard out of Razalana, who proved a very good sire. More recent imports of Crabbet/Hanstead breeding include Falouk, by El Meluk, and Ibn Chantarella, by Orion. In common with many other countries, South Africa has quite a number of recently imported Arabians brought in from various sources with the result that some studs are adding to their stock an infusion of Egyptian, Spanish, Polish or Russian bloodlines. Few people, however, are breeding exclusively from these ‘new’ imports and the majority of Arabians are still predominately English bloodlines. In 1996, I had the pleasure of judging the Vaal Show, a week long Agricultural Show held at Vereeniging, near Johannesberg, where I was very well looked after. When judging overseas one is invariably asked how the horses compare with those in one’s own country. In South Africa I had no hesitation in saying that I thought their best Arabians would compare with top horses in the U.S., and indeed with those I have seen in other countries. On the whole there appeared to be a greater proportion of good legs and feet than is often seen elsewhere. I wondered if this might be due to the wide variety of ridden classes included in South African shows and the aim of most breeders to exhibit their stallions under saddle as well as in-hand. With only one or two exceptions the horses were very well turned out, with far less ‘make-up’ than is often the case these days, and this was a pleasure to find. Most were very well shown, without the excessive stretching and exaggerated ‘raised head pose,’ which always makes it so difficult to accurately assess the arch of the throat, and also the hocks. 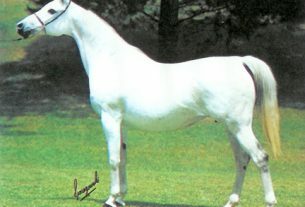 A really lovely mare, Johrhemar El Nura, won one of the largest classes and went on to become Supreme Champion Female. She is by a stallion imported from Germany, Hamasa El Fagr, but carries English blood through her dam, Johrhemar Munifa. The worthy Filly Champion and winner of a strong class, Janbri Vashtali, stood Reserve in the Supreme Championship. She also was by an imported stallion, Rivalry bred in the USA, and out of a mare with English breeding, Shari Silic Shazlena. In the male section one young stallion caught my eye immediately with his presence and way of going. He was chestnut with four white legs and a blaze, and he had a magnificent front with lovely arch of neck and throat. After the show I was interested to learn about this horse, Khwareno Salashah, had been bred in Zimbabwe and had only recently arrived in South Africa; but what was really interesting to me was the discovery that his sire, Timarie Saladin, was a grandson of Azrak, also a chestnut with four white legs, who I had much admired as a colt in England. He was bred by Mrs. E.M. Thomas but she sold him as a young stallion to Rhodesia (as it was then), and afterwards admitted that this had been a big mistake, for the two foals Azrak sired in England, Silver Blue and Blue Sylphide, were both very important; they and their descendants were especially notable for their brilliant action. On the dam’s side Salashah traces to the Crabbet mare Extra Special and to Rabiyas. After being so impressed with Salashah’s unmistakable style and action I was fascinated to discover his ancestry. Reserve to Salashah in the Junior Male Championship was another impressive young horse, winner of the 2-year-old class. This was Jamani Silvern Zenith, by Silvern Gleam out of Jamani Zenita (Grantchester x Zena), and also of Crabbet/Hanstead breeding. He also had an excellent front with style and action; both these young stallions should make their mark under saddle in due course. I finally made them Supreme Male Champion and Reserve. As I have said, there are a great many ridden classes in South African shows, ranging from Riding Horse, Show Hack, Show Hunter (required to gallop!) and Utility Riding Horse (described to me as one you could ride anywhere, with complete obedience a top requirement) to Pleasure Horse, Country English Pleasure, Western Pleasure and Costume. When you add Novice and Junior Rider categories to these, plus Dressage, Jumping with Driving, no one can say that there are not plenty of opportunities for Arabians to show their worth as performance horses, and a chance for everyone to compete! As a result of so many slightly differing classes horses often compete in several on the same day. Outstanding under saddle was the very attractive grey stallion Sadat Dashar, beautifully schooled and presented. He is by Kapronaz, a horse imported from Britain by the Russian Kapron out of Zarzura, who was of all English bloodlines. Dashar’s dam, Sadat Bint Vanessa, was by the Marbach-bred Darius out of a South African-bred mare of mostly English bloodlines. Sadat Dashar, who won five classes and was Champion Riding Horse, was awarded the Purebred Victor Ludorum of the Show. A feature of the show which I found enlightening and encouraging for breeders was seeing purebreds competing in mixed breed classes with considerable success. In fact, the Champion stallion in my section went on to win the All-Breeds Championship under another judge. To be seen competing so well in these open classes can do nothing but good to the breed.